There are more things from the trip east that I want to share. Several of them are at Crown Point. 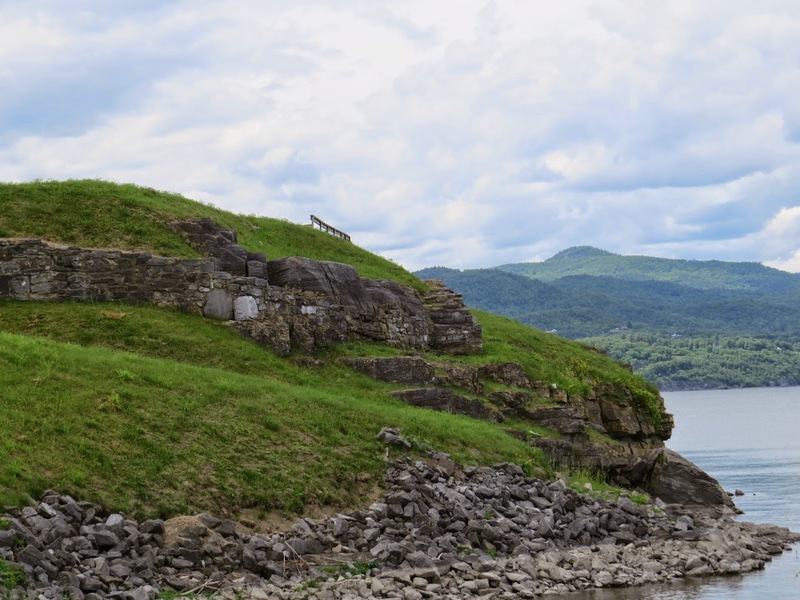 Crown Point juts out into Lake Champlain forcing ships through a narrow neck. Thus it was a strategic point on this early "interstate highway" into the colonies. I've been there three times now, and the museum hasn't been open any of those times. Grrr! I'll just have to go back. Preferably when they are doing a reenactment. 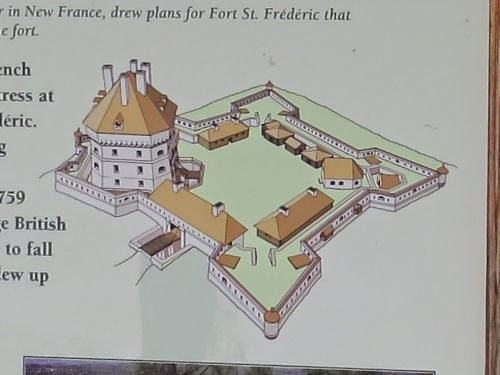 Anyway, the French were the first to build a fort on the site, right at the tip of the point, beginning work in 1734. From the water you can see that when those walls were higher, an attack would have been difficult. 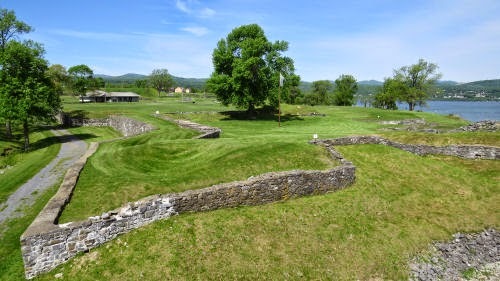 It was roughly in the form of a square with pointed bastions on three of the corners. 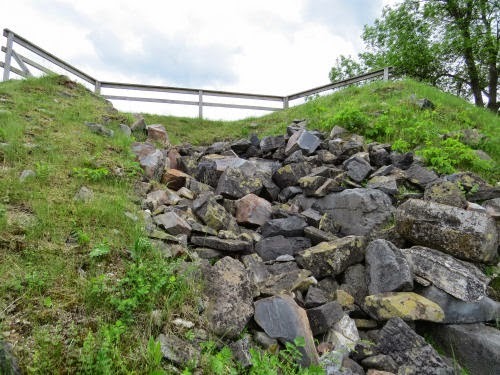 The entire foundation of the outer wall still exists. This picture was taken from the bridge, looking back. It seems incredibly small by today's standards, but housed many officers and men. Here's a sketch based on good contemporary drawings. The citadel was an octagonal fort within a fort with swivel guns mounted on each of the levels. 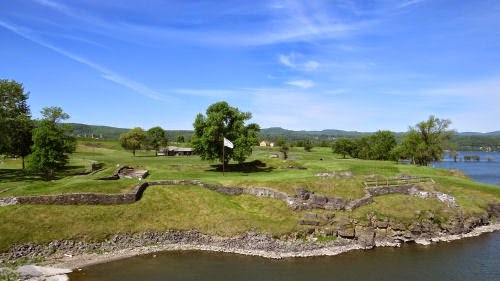 In fact, the fort was so formidable that it was never attacked. However, in 1759 the British advanced on it with 10,000 troops under General Jeffery Amherst. Rather than let it fall into British hands, the French blew up the fort. However, I have a mystery. And it will probably remain a mystery until I can get to the museum when it's open! At the Bridge Restaurant there are old postcards sealed into the table tops as decoration. This is from a folder printed in 1929 to celebrate the opening of the new bridge (the one just previous to the one that opened just last year). 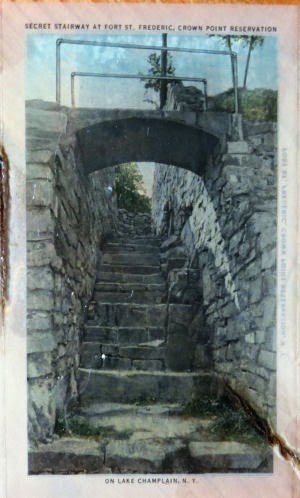 You have to know I'd fall in love with a secret stairway- read the fine print above the picture. Where is the secret stairway? It's a secret, right? It sure is. We walked all over the grounds and couldn't find a stairway at all. Was it here, leading down to this apparent slip where a small boat might put in? Was it over on the right edge of this photo? You can see a wooden guardrail and some rubble leading from there down to the beach. This is the location of the drawbridge over a dry ditch that was the main entrance. 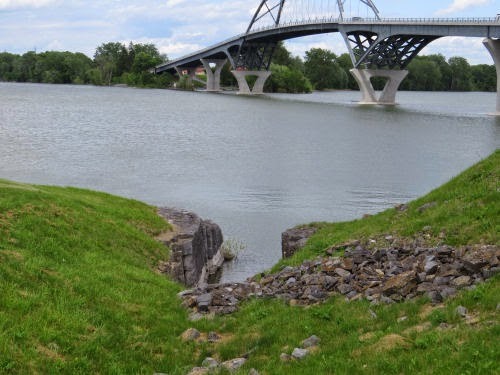 Was the secret stairway beneath the drawbridge? Even farther right is another wooden railing where the land drops off below it. Where might this have gone? Was the stairway there? If so, it's been filled in since 1929. Bummer. Looks like a great setting for a story to me! The day got off to an iffy start with gray skies and a downpour. 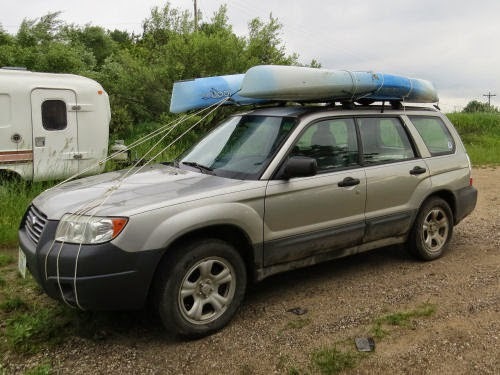 But I had loaded the kayaks last night, and things can always get better, right? 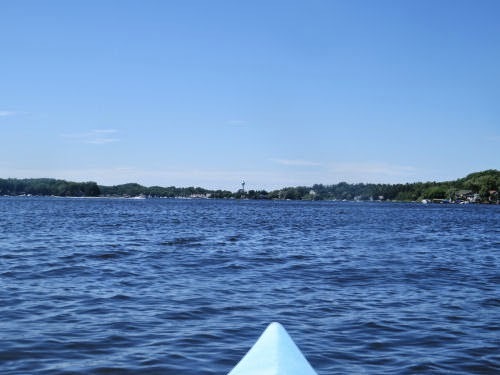 I have the loan of a kayak for the summer from Dave and Loren, who are off bicycling across the country (see A Front Seat View). The rain and clouds blew away and the sky turned blue. So after church, we launched the kayaks into Pentwater Lake. 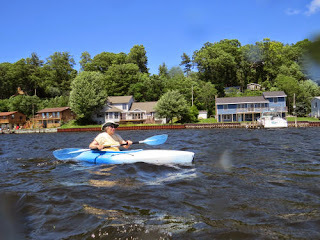 The wind was strong and the water choppy, but not too bad. 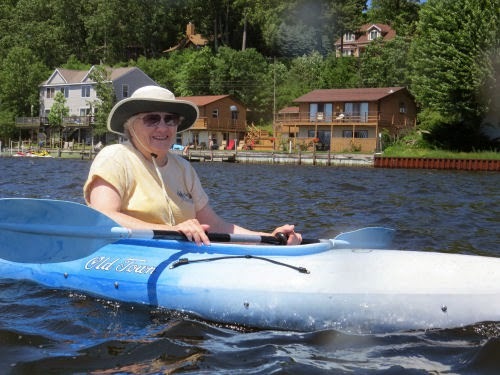 Fortunately, we were paddling against the wind on the way out, so we knew it would be easier coming back. How far did we go? We paddled all the way to Longbridge from the marina. I took this picture just after turning around, and our return destination is beyond the water tower. But the wind pretty much pushed us back. We sure made the return trip faster! Total miles, about three, in roughly two hours. By then our small lunch had completely worn off so we got sandwiches (I had a BLT, Loretta had grilled cheese and ham), then we went to the local patriotic concert. Excellent program! It was a wonderful, relaxing day, and I feel as if I can actually face work tomorrow! Thanks, Loretta! This was our last day for this hike, and truth be told, we probably could have hiked out the day before. But we didn't want to. (I can't speak for Marie, actually, but I didn't want to, and she knew I didn't want to, and she likes me.) 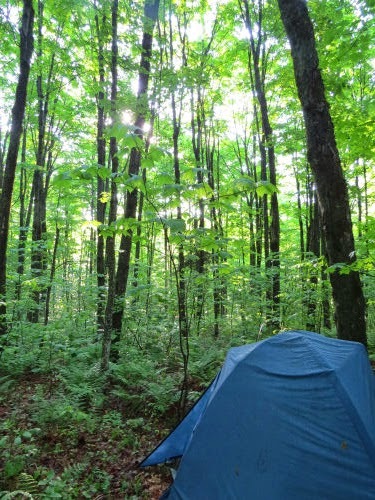 So we had one last night in the woods, and awoke to a lovely morning despite going to sleep in the rain. 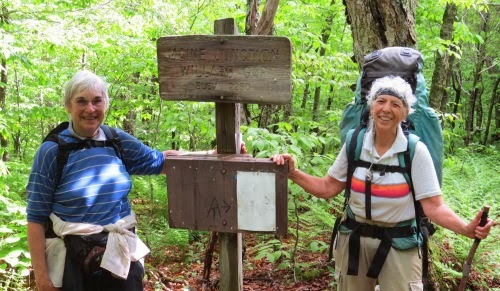 There were just four miles to go to reach the car, and only three to make it to the big goal, a place called "Maine Junction." That's just a fork in the trail where the Long Trail and Appalachian Trail meet (for southbounders) or split (for northbounders). It will eventually be the new eastern end of the North Country Trail. We were feeling happy and the trail was relatively easy. There was a steady uphill for the first couple of miles, but it wasn't difficult. We rested at a bivouac area. 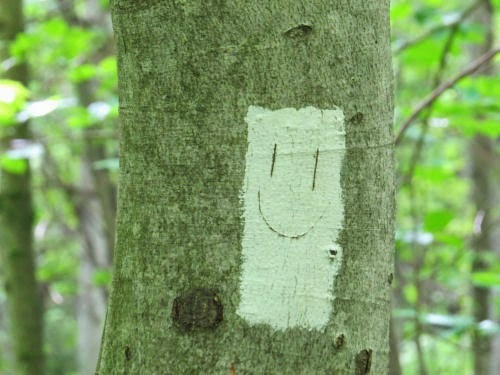 Even the trail markers were happy! And if you were wondering, the Long Trail is marked with white blazes. Before we knew it, there we were! 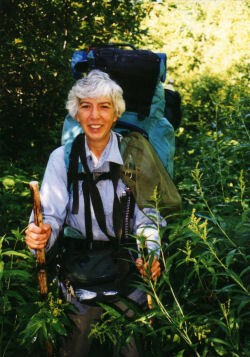 Maine Juction, and two smiling hikers. 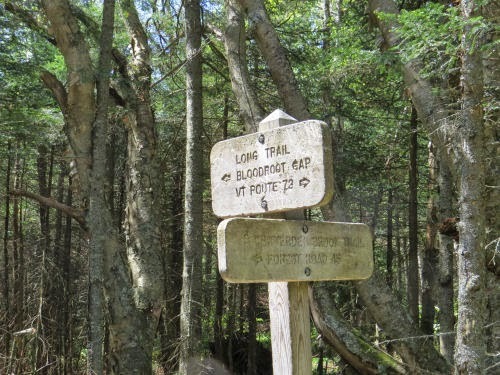 We'd passed quite a few hikers on the Long Trail, all NOBO (northbound), over the past few days. In the final mile to the car on the shared trail, we passed one hiker. I asked him if he was hiking the Appalachian Trail or the Long Trail, and he said the AT. But he was clearly intent on moving along and we didn't chat. We reached the parking area just before 11 am. First priority at the car? Let the feet out, of course. The next priority? Iced tea and a nice meal. 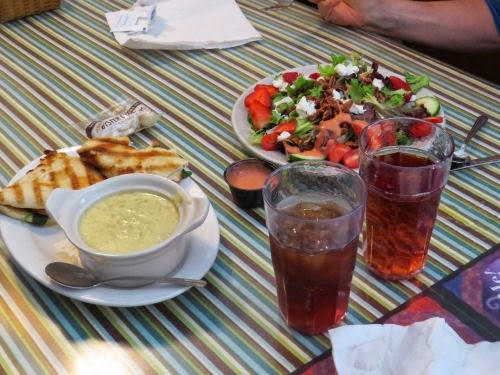 We went to the Rochester Cafe, in, duh, Rochester, Vermont. Recommended! Here's the map. 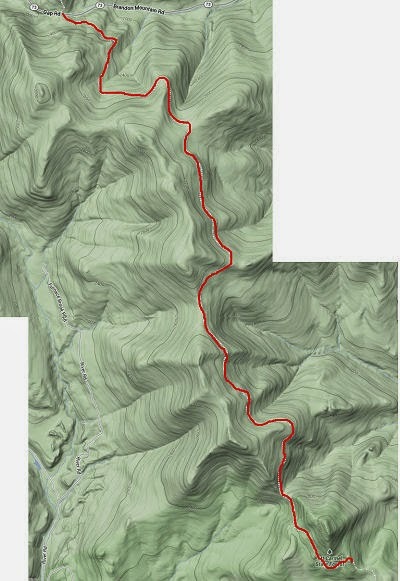 The Long Trail and our route is in red; the AT is in white. The farther south we hiked, the easier the walking. Overall, the day was to be downhill, and an easy one. We had lots of time to joke about things like the trail building technique used there to stabilize trail by taking it around a tree on the uphill side. So, maybe we didn't climb 900 vertical feet, but we might have stepped two feet up to get around 450 trees. 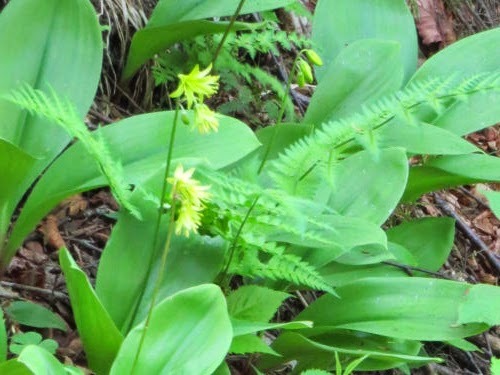 We always see lots of Clintonia on our May/June northern hikes, but I never get tired of the cheerful yellow flowers. As for the hiking itself, my stamina was improving and we walked 40-45 minutes between rest stops, easily. One requirement when backpacking is to avail oneself of clean drinking water. 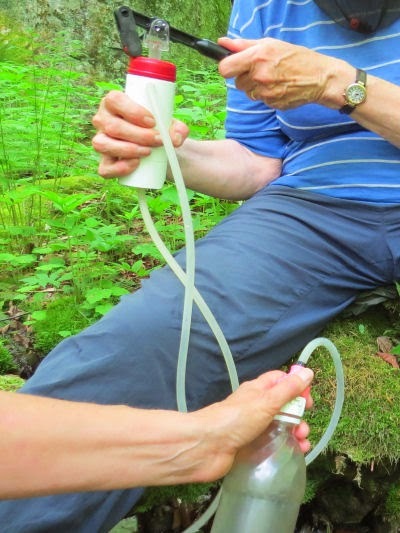 Although we'd used a Steripen for the last couple of years of backpacking, we went back to the filter for this trip. The Steripen needed new, expensive batteries, and we like the filter just fine. 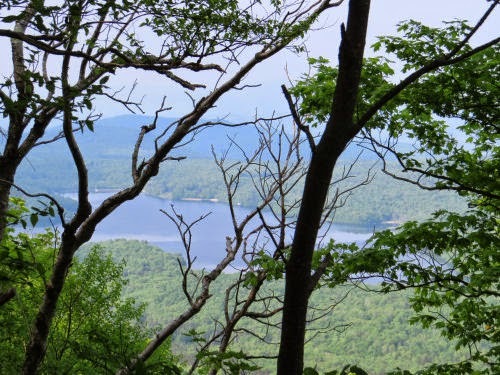 On the map you can see a large body of water on the west, Chittendon Reservoir. It was a welcome sign of progress when we began to see it from the trail. 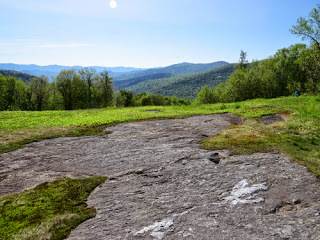 The trail followed a ridge for a while, with views of Blue Ridge Mountain. Not to be confused with the Blue Ridge Mountains, farther south. 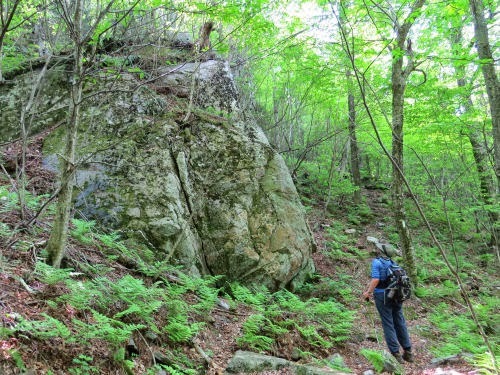 We crossed a snowmobile trail and a creek, and ascended beside this impressive rock. There was just a funny jog east and then back west, mostly downhill from the looks of the topo map, until we would reach Rolston Rest Shelter. Again, we were going to go past the shelter and find a campsite, but it was more or less our goal. Well, we kept hiking uphill, way to the east, for over half an hour. The trail made the jog back to the west. Now we'd go down to the shelter. Wrong. We kept climbing uphill. The elevation profile was clearly wrong. I kept looking at the topo map, wondering if I'd read it wrong (very fine detail), but the red line sure appeared downhill to me. We climbed that interminable downhill line for another 35 minutes. I was doggoned if I was going to rest before we reached the shelter. Finally, there was a short downhill, a private road crossing, and there we were, at the shelter in time for lunch. OK, a late lunch. We stayed there for a couple of hours. 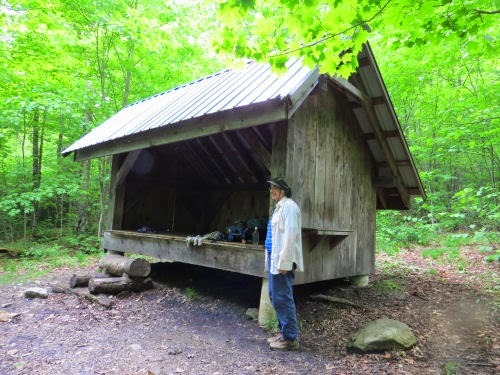 We'd met quite a few hikers in the past few days, all northbound, but they'd all been using the shelters for sleeping. Another reason I'm not crazy about shelters... I'm not that social. But we love to rest in them mid-day. We read and signed the log book- always fun. We played our game in comfort, leaning against the walls. About four o'clock we wandered on down the trail for another 25 minutes, and found a decent tent site. We got set up and zipped in just before the rain began. We didn't even get sprinkled on! Just one more day. I'm always excited and sad at the same time about that point in time. How about starting with some explanation. 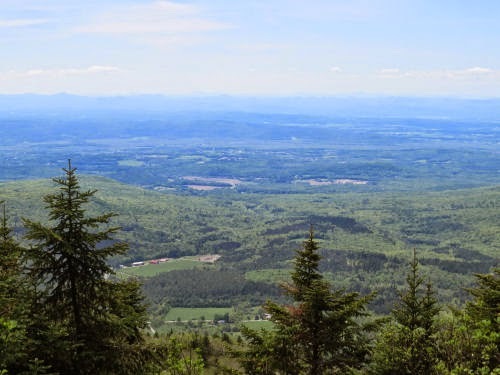 The Long Trail runs the north-south length of the state of Vermont (Massachusetts to Quebec), for 273 miles, along the ridge of the Green Mountains. 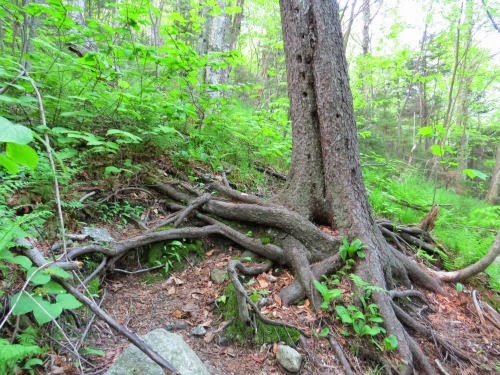 It's concurrent with the Appalachian Trail for the southern third. In this overview map, you can easily see the string of mountains. For reference, our hike is marked with yellow for road walks and red for trail, with the red strip on the eastern end the Long Trail Portion. As I've not let you forget, we had to get creative to finish this hike together. So, Monday morning, we took down the tent and began re-organizing to see if my pared-down pack plan would work. The yellow tarp is just to keep things organized and clean (we weren't going to carry it), and the plastic box wasn't going along, but the contents were- the food. 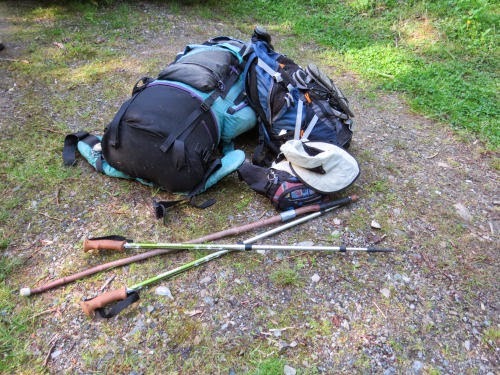 After my night-time machinations about what to leave out, we took out even more, including some of the food (we'd been eating less than usual too), and my fanny pack, just keeping a few essential items usually carried in it like the compass and insect repellent. Did it work? We got everything in Shamu, and Marie's daypack, and weighed them. I had 28 pounds and Marie had 15. This was definitely do-able. We even took one non-essential- our card game. Then we had to drive to the starting location, but even so we started hiking southbound at 9:45. Not great, but not bad with all the prep time. We hoped to make it seven miles, just past the David Logan shelter and then find a place to camp, but if that was too far, we'd take whatever adventure came to us. 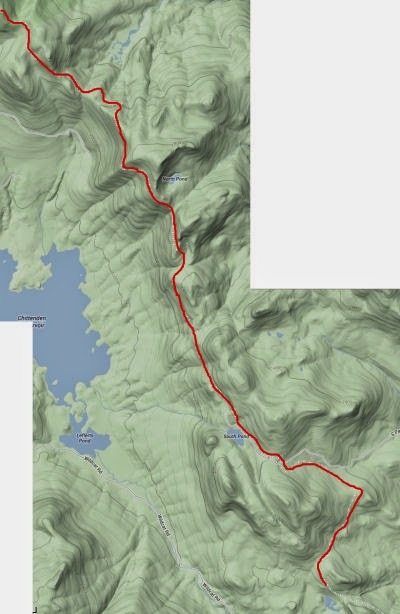 The first and biggest climb of the day was about 950 feet to Bloodroot Gap. But we were thrilled to discover that the grades were much easier today. The first 2.5 miles were a very gentle climb. Nevertheless, recall that I haven't backpacked in four years, and was sick before this trip, and still wasn't 100%. For most of the day we stopped every half hour for a short break. This is all humiliating to admit, but I'd rather walk 30-minute stretches than not walk. In an hour and a quarter, we'd covered 2.3 miles, and reached this marker. It's nice to have markers, so you can track your progress, even if you are going slowly (that's way slower than our usual pace). Even with Shamu on my back, and lower stamina, the weather was awesome, and nothing could keep me from enjoying this. 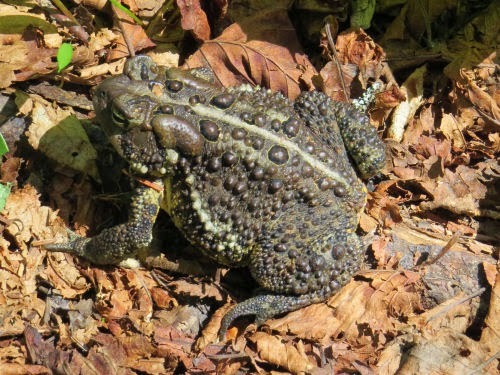 We saw quite a few toads, but this was the first, and it was perhaps the largest toad I've ever seen, outside of a zoo. It was the size of my fist! 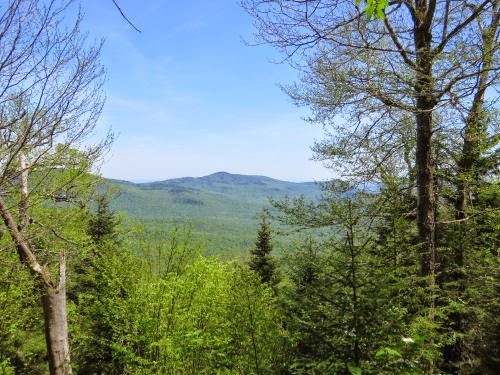 There was no sign actually marking Bloodroot Gap, but this may have been the view from it. It's really a high col between Farr Peak and Bloodroot Mountain. The afternoon was a series of ups and downs, none of them awful, but they were somewhat frustrating because the reality didn't match the elevation profile on the map very well, which suggested that section of trail was going to be mostly a descent. 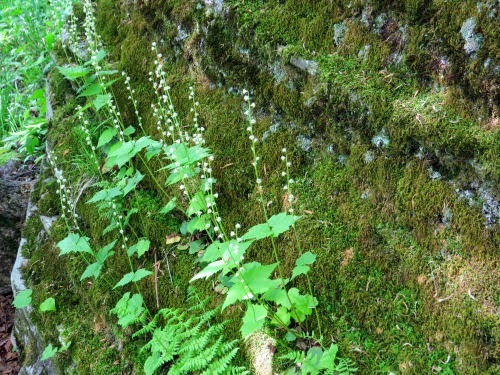 There were innumerable lovely rock gardens, this one filled with miterwort. We finally passed the shelter turnoff, and began looking for a place to put our tent. 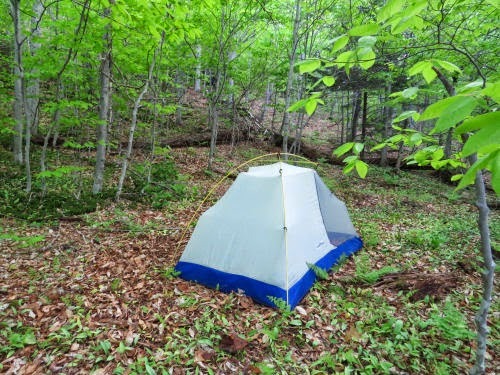 Dispersed camping is allowed, and the black fly and mosquito populations guaranteed that we wanted to be zipped in the tent. We did find a lovely spot. Miles for the day, about 7.2. Camp chores include hanging the food out of the reach of critters. The flies didn't get the food, but they were working hard on me while I got it hung. Taking it slow was a good idea for yet another reason. 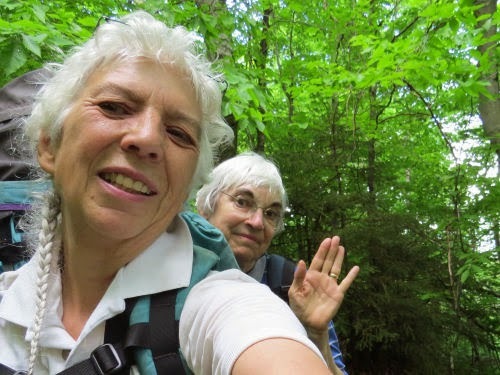 This was like a second ending of the North Country Trail... after my "big deal" final hike in 2010. Of course, I never want the hikes to end, and this allowed us to prolong the adventure a little longer. We enjoyed the mild evening and played our game protected from the biting vermin. 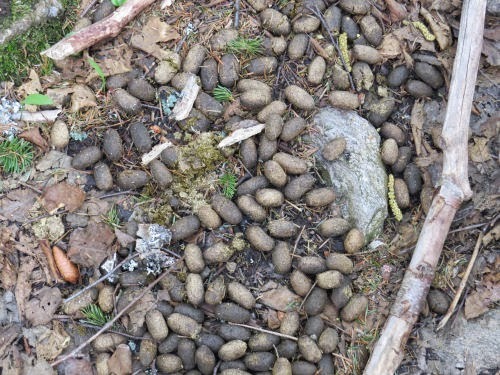 We still had a problem for how we were going to do the Long Trail. Our decision to not backpack was going to make this nearly impossible. 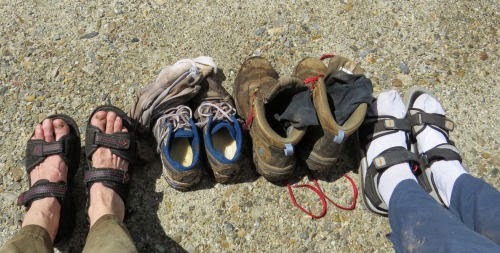 One day could be done as a day hike, but the final 20 miles had no road crossing. It would be possible to get to the trail from a side trail, but it was a mile hike in, straight up, and made one day tolerable, but the other day a grueling 14 miles on mountain trail. I know that young thru-hikers would scoff at this "low" mileage, but we aren't setting any speed records, we just want to do it and enjoy it. Marie was seriously thinking about letting me hike it alone, while she spotted me with the car. I would have done this as a last resort, but I really wanted to share the experience with her. Friday night I had lain awake thinking about how to make this work. We also had a time constraint, because Marie had to be home no later than Thursday. I mentally re-shuffled gear, tried to remember weights of individual items, agonized over things I considered essential. Saturday morning when we awoke I told Marie I had figured out how to do it, if she would agree. 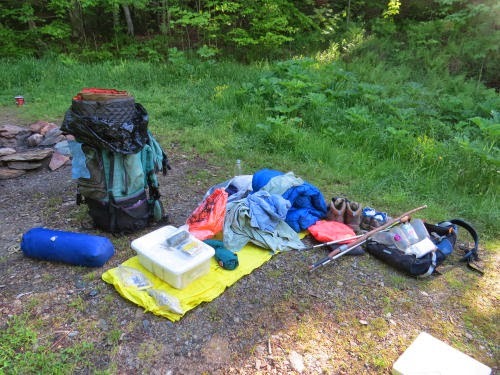 I decided that if I carried both sleeping bags, the tent and the mats, my clothes, and a few other things, she would only have to carry the food and her clothes. Despite how I thought I'd already left a bunch of usual items at home, I pared the list down even farther. I reminded myself numerous times that this would be for two nights and 2.5 days, not nearly as "serious" as two weeks on the trail. I had brought a scale with me, but we didn't want to strike camp and test the theory, then have to set everything back up. So I convinced Marie it would work, and she agreed. 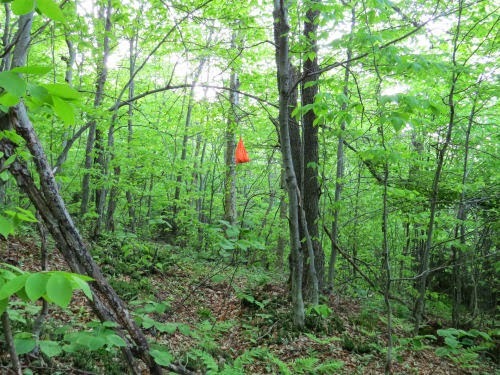 So, this, our first day on the Long Trail, we were still hiking with just day packs. We decided that was good because it looked like this day was going to be as hard as the first day on the Finger Lakes Trail. 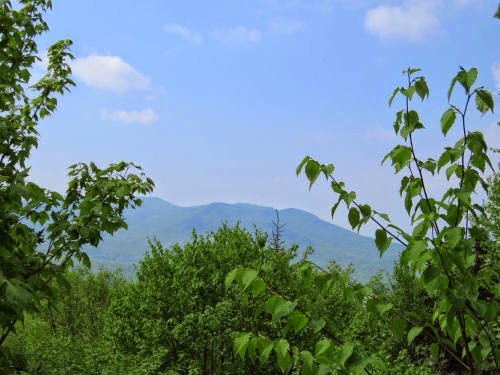 It began with a 1200-foot climb straight up from Middlebury Gap to the top of Mount Worth. This was a long climb, but the grades were better, without as many angled rocks. 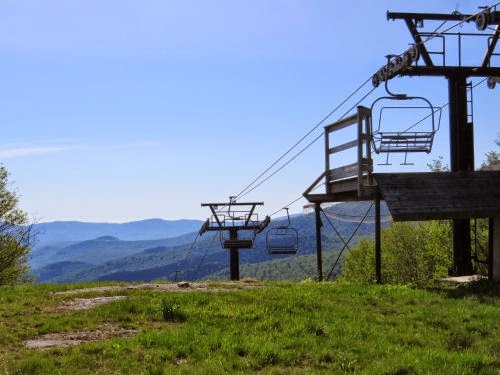 At the top we learned that the trail goes through the Snowbowl Ski Area, also part of Middlebury College. You can see that we are right at the top, 3224 feet. The view west. This was only the first mountain of the day. We immediately started back down 1200 feet to Sucker Brook. 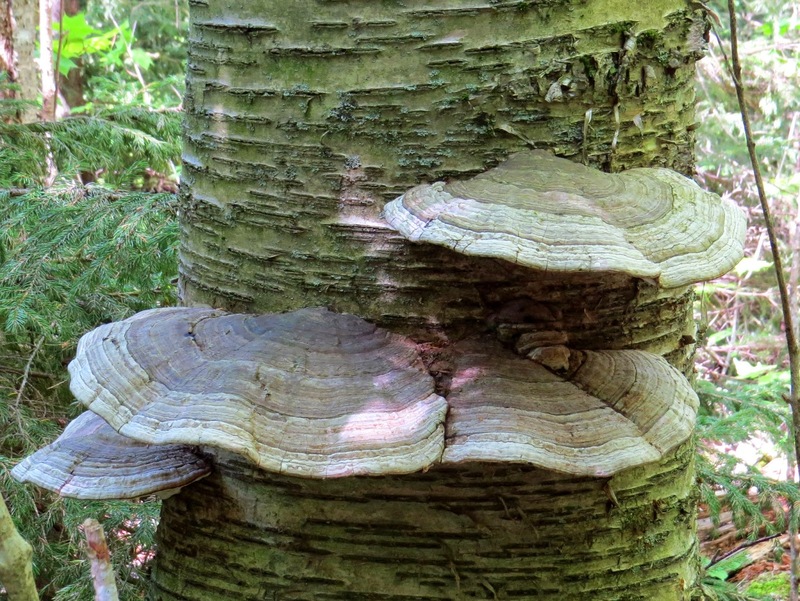 I just liked the textures of this fungus and the bark. 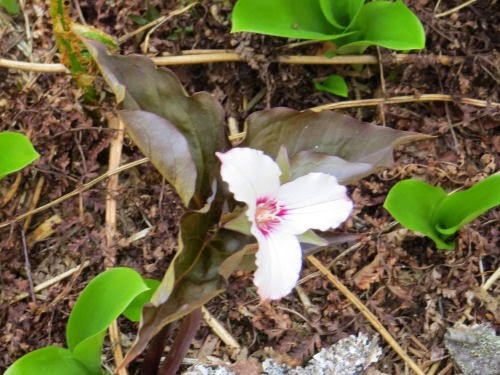 As we've seen both in the Catskills and here, there were lots of Painted Trilliums. However, the ones we saw here had universally dark leaves. I don't know if this is something about soil chemistry, a cold spring, or some genetic variation. It sure made the blooms stand out. Meanwhile, we began climbing again, up Gillespie Peak. 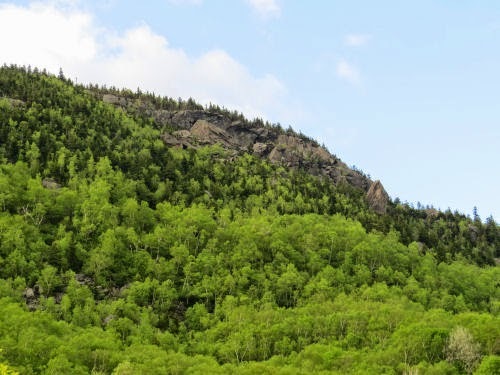 I have to admit, I'd felt a little intimidated by the Green Mountains- probably for a couple of reasons. One, I'd never really been there before. Two, the way they just appear out of the lower altitudes makes them look huge. 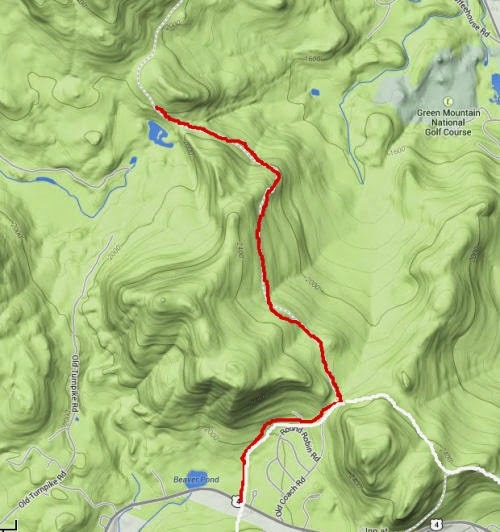 But when I was studying details on the map, trying to figure out how to make the revised hike work, I realized they weren't as high as we'd been in the Catskills. This would be our highest point of the day at 3366 feet. 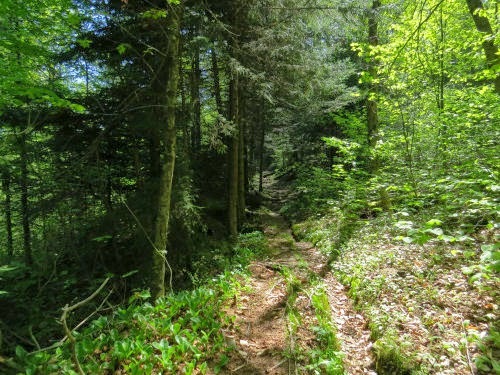 Although the trail was not a "walk in the park," this trail has a long history of good care. 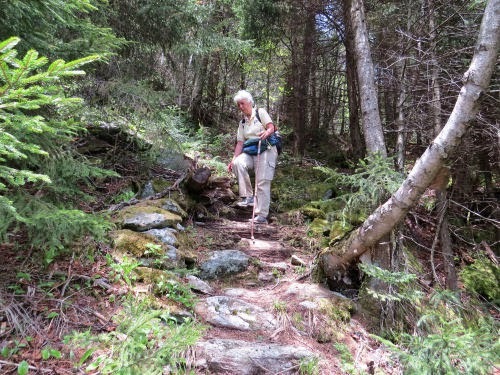 It claims to be the oldest hiking trail in the country. In this picture, I'm making my way down Gillespie, and although steep, you can see the steps. There is a serious amount of rock work that's been done. Rock steps, rock water bars, and stones flanking stream crossings are the norm, providing stable footing and good drainage. After Gillespie, the trail took several more ups and downs, although none of them so severe, then climbed to Cape Lookoff Mountain. There was no sign, but we think this is the view from that peak (looking west). Our next peak was to be one called Mount Horrid. How's that for a name. We already knew that we wouldn't have a view from it. The side trail to the cliffs are closed most of the summer months to protect peregrine falcon nesting habitat. But from below, at the road where we ended the day's hike, there was a turnout to view the cliffs. Here's what we were just on top of, before descending to Brandon Gap. Mileage for the day 10.1 miles. We felt as if we'd worked hard for our dinner, but we weren't nearly as tired and beat up as we'd been that first day of this trip. Stay tuned for how the final 20 miles worked out!